Jim Boucher, Carole Laporte, Mark Gorry and Rory Fitzgerald will attempt to swim at least 50K in an unprecedented crossing between the Isle of Man to the Irish coast on June 20th. 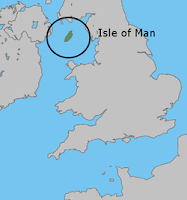 The Isle of Man is located in the Irish Sea between the islands of Great Britain and Ireland where the four-person team will take to the waters - currently hovering between 10-11°C (50-51.8°F) - in one-hour segments strictly following the traditional English Channel rules. "We are the same team as last year with the same boat crew from Peel and the same sea kayakers. We're same group that tapped basking sharks on the snout [during the swim]," said Jim. "But this year, the winter has been colder and we will need an increase of biblical proportions to give us something like 12-13°C (53.6-55.4°F)." "The Irish Sea has a neutral point, tide-wise, around our intended course and we will be aiming for Ardglass, North Ireland. Water should be cold enough not to have jellyfish. We expect a 18-20 hour swim giving us at least 4 legs in the water. It's not been done before. To add some spice to it, a six-person wetsuited relay is heading the opposite direction on the same day.."